Immerse yourself in local culture with our flexible, tailored tours. Simply pick and choose the tour options that appeal most to you, from the list below. Toby, Fortress of the Bear's female brown bear. Living in Sitka means living in bear country, so we have had to learn how to manage our behavior and respect these amazing creatures, not fear them. Fortress of the Bear and the captive ambassador bears that you will meet on this tour, play an important role in local education. By decreasing the initial fear of bears and increasing people's knowledge about them, and how to live safely and responsibly with them, Fortress of the Bear helps to maintain a peaceful coexistence between humans and bears. If you select a visit to Fortress of the Bear as part of your tour package, we will spend time on the viewing deck over looking the large enclosures, and watch the bears interacting with each other and their environment. One of the first things I did when I arrived in Sitka was start volunteering with Fortress of the Bear, and to this day I spend as much time at this amazing bear rescue facility as I can. I have spent hours observing the bears, getting to know them individually and learning all about their intelligent and creative natures. Fortress of the Bear is currently home to eight orphaned bears that would have been euthanized, had they not been rescued and given the health care they need. Five of the bears are Alaskan Coastal Brown Bears and three are Black Bears. As a long standing volunteer of Fortress of the Bear, I look forward to educating you about the things I have learned in my time there, such as the importance of enrichment, training and diverse habitats. To learn more about Fortress of the Bear and their work, you can visit their website. One of Sitka’s most beautiful features that visitors to Sitka rarely have the opportunity to enjoy, is the array of gorgeous and varied hiking trails. I will customize your hiking experience to your specific needs; you will be able to choose from one of three ability levels of hikes. Mild, moderate and difficult. All trails offer stunning views including waterfalls, lakes and abundant flora. The photo opportunities are fantastic! Restrooms will be available at several locations before and after your hike. Your guides are very familiar with Sitka trails. For those of you who would like a challenging hike and have several hours to spend I can arrange a guide to take you on a 4-6 hour hike. There are three hikes available for you to choose from. Mt. Verstovia, Harbor Mountain area, and the Starrigavin Ridge. All three hikes lead up to the alpine, so this tour option will take you to places that very few visitors ever see. The views are spectacular! 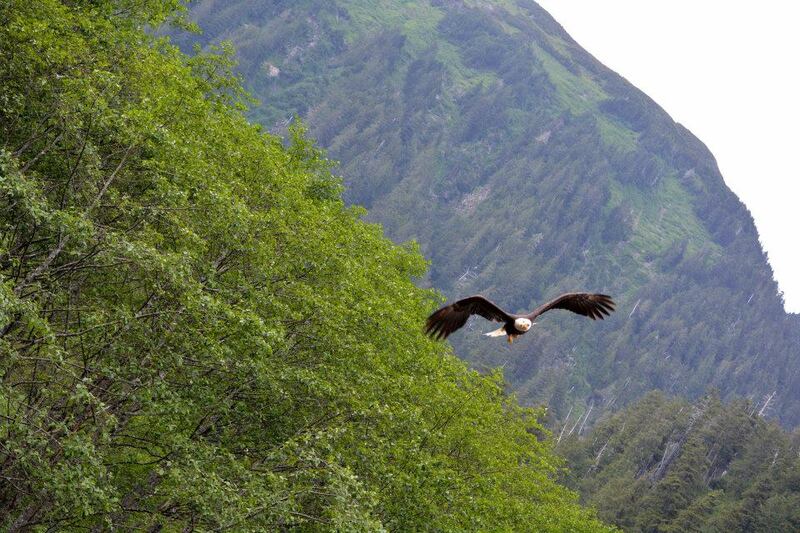 You may also catch glimpses of local wildlife such as Sitka blacktail deer, eagles, ravens and brown bears. By mid summer, the alpine will be bursting with colorful flora. Your guide, Jeff Arndt is a 40 year resident of Alaska and very experienced on these trails. Be aware that the terrain on these hikes is steep and the footing sometimes difficult. This tour is only suitable for experienced hikers that can provide their own necessary hiking gear. Due to the nature of these hikes, availability on the day of your tour will be weather dependent. History fans will be interested to learn that Sitka was a very active Army and Navy base during WWII. Many remnants of this time are still scattered about the island and on Japonski Island. If you select this two hour history tour, your guide will tell you about the lives of Sitkans during the war. Highlights of the historic artifacts you will see, are old bunkers, a radio tower, a tarmac used to launch the PBYs and much more. You'll have an opportunity to enter an old bunker and walk on the tarmac to view the tie downs for the planes that still exist, on what is now a parking lot. If you'd like to see a range of local sites and landmarks, this driving tour option is perfect for you. I'll take you to visit the Artesian Well, to taste the delicious pure water that Sitkans gather for their personal use. Sitka also has the Baranof Island Brewing Company to offer. Here we can sample locally produced brews, or delicious non-alcoholic root beer. We'll also visit our unique golf course, which is built up into a mountain. Golfers have been known to drive their carts around wild bears to continue their play! We'll drive through the Native Village, to see the historical Tlingit homes, and if the tides are low we'll walk out to 'Magic Island'. There will also be a stop downtown at the Island Artist Gallery, a store filled with goods created by our local artists, and a stop at a nursery to pick locally grown veggies. And of course, we'll make a stop at the infamous Pioneer Bar! Beware - if you ring the bell, you'll be expected to buy a round of drinks for the whole house! This charming, quirky bar is frequented by local fisherman and filled with fishing photos, hung as a testament to how vital the industry is to our community. We try to provide a wide range of experiences for you to choose from. However, if there's something you'd like to do, or somewhere you'd like to go, that's not listed above, contact us and we'll do our best to accommodate you! All prices listed above include tax, but do not include gratuities.